When Long Islanders are in need of dumpster rental or demolition services, there’s only one company they call: Prestige Carting. For more than 20 years, this highly regarded company has been providing outstanding dumpster rental and demolition services for the homeowners and business owners of Long Island. With affordable prices, fast results, and a proven track record of success, it’s no wonder why Prestige Carting is considered the best around! Whether you want to bring your outdated kitchen into the 21st century or you need to add more square footage to accommodate your growing family, renovating your space can be extremely exciting; however, it can also be a daunting task. Organization is the key to renovation success. Before you start knocking down walls, and calling carting companies, use this handy checklist to organize your project and ensure its success. First things first: Determine exactly what it is that you want. Create a list of the things that are an absolute necessity, like more square footage, new appliances, updated fixtures, and so on. Then include the things that aren’t essential, but that you would like to include in your renovation; higher-end appliances or new furniture, for example. Remember that you should first concentrate on the things that you need. If your budget (and if time) allows, you can then focus on your wants. Browse through home improvement magazines, visit design websites, and take a trip to your local home supply store to get some inspiration. If possible, you may want to consider hiring a designer to assist you. If you have a basic idea of the layout and look you would like to create, you’ll have an easier time communicating your wants and needs to your contractor. Once you’ve come up with a concept for your renovation, determine how much you can comfortably afford to spend on the project. Remember that the things you need are top priority, so your budget should focus on those things first. You should also consider leaving some wiggle room, as it’s not unusual for the unexpected to happen with home renovation projects. After you’ve allocated funds to the things you need and unexpected expenses, you can start setting aside funds for the things you’d like to have but aren’t a top priority. Once you have created your budget, you can determine what projects you can tackle on your own to save money and which ones will be best left in the hands of a professional. Create a timeline of events for your renovation. Pick a start date and decide when you would like everything to be completed. Be realistic with your timeline. If you’re going to be doing a major overhaul, including a completely upgraded electrical system, new plumbing fixtures, and the installation of new hardwood floors, for example, it’s probably going to take more than a few weeks to complete. When you’re creating a renovation timeline, make sure you take weather into consideration. For example, the installation of a new roof would be best to complete during warm weather to avoid any delays. If you aren’t the handy type, you’ll want to hire a contractor to handle your renovation. A contractor will be able to make the necessary decisions and arrangements for your project. For example, this professional can recommend electricians, plumbers, and other specialists. 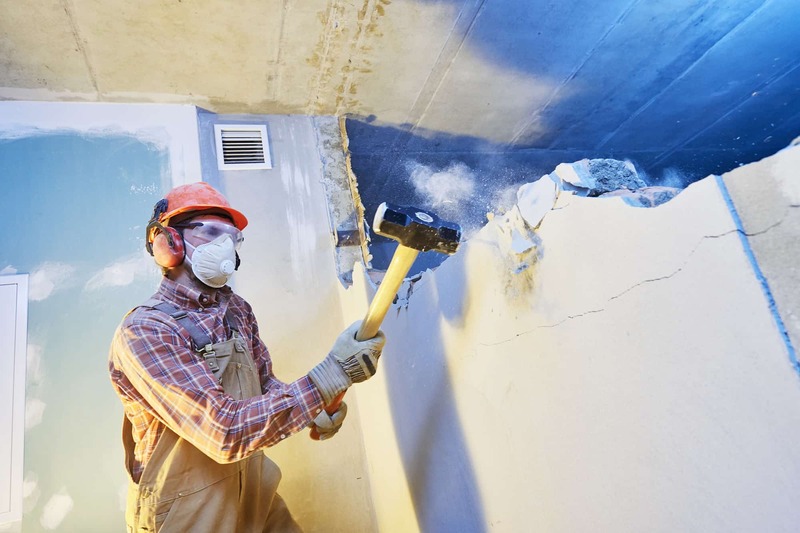 Even if you are going to attempt to complete the renovation on your own, you should still consider hiring a demolition contractor. Taking down walls and pulling up floors is a lot harder than it first appears. With a demolition contractor, the structural integrity of your home won’t be compromised and you can avoid derailing your renovation. Once you know your goals and when you’re going to start the renovation, make arrangements before you actually get started. For instance, you may want to rent a storage unit to hold furnishings that you want to keep but don’t want risk having destroyed. Additionally, if the renovation is going to be expansive and infringe on your daily life, it might be a good idea to make arrangements to stay with family or friends. It’s also a good idea to hire a carting company before you get started. Renovations involve a lot of debris; even smaller ones. By having a dumpster or a carting company on-hand, disposing of that debris will be a breeze. By following this timeline, you can ensure that your home renovation will start – and end – on a positive note. A home renovation is a major investment. Make sure you set yourself up for success by having a solid plan of action before you get started. Contact Prestige Carting to check dumpster rental and demolition off your list! Their efficient, affordable, and reliable services will ensure your renovation goes as smoothly as possible.